De Castro, West, Chodorow, Mendler, & Glickfeld, Inc.
De Castro, West, Chodorow, Mendler, & Glickfeld is located at 10960 Wilshire Boulevard (one block West of Westwood Boulevard), Fourteenth Floor, Los Angeles, CA. From the 405 Freeway - Take the Wilshire Blvd. EAST exit toward UCLA. Our offices are three blocks East of the freeway on the South (right) side of the street. Parking is available in the parking structure adjacent to the building. 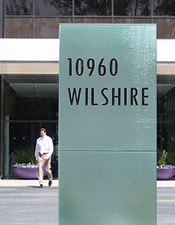 Parking entrances are located on Wilshire Boulevard and Midvale Avenue. Once inside the building, take the East elevator (high rise elevator) to our lobby on the 14th floor. De Castro West provides outstanding opportunities for attorneys who will complement our Firm's culture and practice.